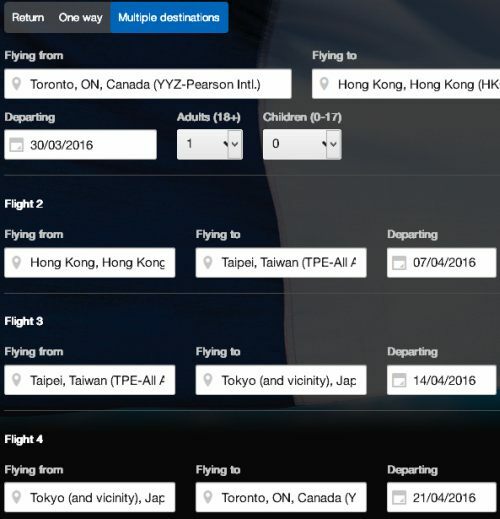 The 3 in 1 trip to Asia involves flying from Toronto to Hong Kong, to Taiwan, to Japan, and back home, all for as low as $801 CAD roundtrip including taxes. This is even cheaper than when it appeared back in November 2015 for $911 CAD, which was already a pretty incredible price. The pricetag is around what one would typically consider a very good roundtrip price from Toronto to just one of these 3 countries on their own. It can be worth experimenting with other dates if you want to try staying for shorter or longer periods of time. Using Tue, Wed, Thu dates is probably your best bet to start with. If you discover any date combinations that are not listed, please share in the comments section to help out your fellow travelers. Note that sometimes you may fly into Tokyo's Narita (NRT) airport, but fly out of Tokyo's Haneda (HND) airport. Haneda is the one that's closer to downtown Tokyo. toronto, yyz, flight deals, air canada, asia, tokyo, japan, nrt, east asia, hnd, taipei, taiwan, tpe, hong kong, hkg, cathay pacific and hong kong airlines. 12 Responses to "The 3 in 1 trip to Asia is back! Toronto to Hong Kong, Taiwan, AND Japan for $801 to $925 CAD roundtrip including taxes"
This is a fantastic deal. If one can take 3 countries plus include Korea as well, this one cannot be beat. Book the Air bnb and one has got it made. Thanks Chris, this one will perk up my summer holiday plans. 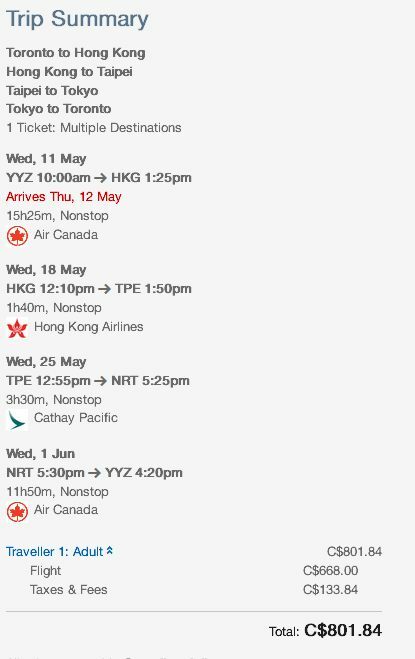 Can I go from Toronto to Korea - Taiwan -Hong Kong-Toronto? I think it may have expired. i punched in the: October 5 to 12 to 19 to 25 -- $801 combo and it no longer gives me such pricing. I'm looking at June 2 -18th, for $1200. May isn't going to work out. Is this still a steal? I made various attempts for the month of June and I was able to come up with a range of $920 - $1080. The trick is to book a flight departing on Tuesdays instead of Thursdays, Fridays, or the weekends. You must return before June 30th in order to keep the deal under $1100. I was able to book for $945 but that was the price for 2 adults and one child (children cost a little less so it brings the average down to $945. Barbara: Just saw a Toronto - Hong Kong - Taiwan - Seoul for $797 this afternoon. Play around with the date combinations and you might find a cheaper deal still. No longer in the low $800 but around $900 still. Currently at $964 on Wed. afternoon. When will this deal expired?? By the way, I can't get $801 anymore.